I am a 59-year-old wife, mom, adoptee, and retired educator. of which was quite an honor and privilege. even had a stint at coaching girls track. Alzheimer’s Disease/ dementia that lead me to the decision to retire after 31 years in the classroom. more flexible and available to my dad and his growing needs. our journey and struggle intensified but our hope never diminished. Dad passed away on March 19, 2017.
despite the fact that I actually came into this world as someone else’s child. as well as a fascination in the creation of Eastern Orthodox Iconography. I am also a very deeply spiritual individual who embraces my Christian faith very seriously. I am the created and not the Creator. so I thank you for deciding to come along with me on this adventure. I have been keeping up with your posts and they have all been as inspiring as they have been comedic (especially your reflection about the passport snafu)! I look forward to reading more! Keep the creative thoughts coming! I’m glad you are able to be there for your father. Thank you for following! Blessings. Thank you Sister Pat ( is that correct? ), if you don’t mind I would like to touch base via email as I’ve really enjoy your blog posts and the website for your order. Again, thank you–blessings to you as well! Please feel free, Julie. My email is pfarrellop@gmail.com. Blessings! Hi, Julie. I found your blog via comments you left at 09History. I am also a retired educator (28 yrs + 11 with Railroad Industry)…I say retired…I left the school system in 2008 but still do educational consultant work via Florida DOE. My husband and I moved from Florida to Georgia in 2011 back to home roots! If you get a chance hop over to catnipoflife (http://catnipoflife.wordpress.com/) and her sister site Awakenings (http://awakenings2012.blogspot.com/). Catnip is more inspirational and Awakenings is about America. Some of my Awakenings postings are scooped to catnip but not all. Would love to ‘see’ you stop by for a visit. I was visiting your site when I saw the notification come through. Started following you, too! Left you another link you might be interested in visiting 🙂 Glad you enjoyed the story! It sounds like you have traveled similar spiritual journeys. I enjoy your insights and look forward to the continued journey. What a lovely, funny at times, warm, rich, and inspiring blog! Beautiful photography! Thank you for visiting the Wind Horse Blog so that I could find you here! Hi Julie, I saw you stopped by the blog. Thanks for introducing yourself! Hi Julie, loved your writings and article. You are truly inspiring for kiddos like me. Thanks for sharing your amazing world. Your blog is full of inspiring , beautiful thoughts and images. A breathe of fresh air , a place to calmness. Hi Julie, you are truly inspiring, thanks for reminding me that ” I am the created and not the Creator.” your words are truly inspiring. and I share the same passion for travel. I travel to get out of my comfort zone and be reminded of how beautiful our world is, to be thankful for the opportunity and to simply love the life our Creator gave us. I look forward to read more from your blog. With immense pleasure, I hereby nominate you for READER APPRECIATION AWARD! Its a great blog that you run here. So good luck. Hope this little recognition gives you the extra little kick to come back every day and share your thoughts with the vast world awaiting to hear you. I have several good friends who are currently art educators–no wonder I enjoy your blog! I’ve always enjoyed being around creative folks who take great joy in the world God’s created and in creating art of their own. God’s blessings as you care for your Dad and as you continue to share thoughts and images here! Please, permission to use your photo of the church in the woods on a CD album called “Hymns & Offerings”. I produce my own CD’s by making sound tracks on the computer and recording my trumpet. I would be glad to send you a CD as payment. Chester Caswell – Principal of Charleston SDA School, and owner of Caswell on Selmer. I need to publish these by May 2. Hi Chester–I am assuming you want the image of the chapel at Callaway Gardens? You may certainly use the image if you will credit the church, the location, as well as credit it as my image. Hi Julie! My name is Cameron Von St. James and I had a quick question for you! I was wondering if you could email me at your earliest convenience at cvonstjames AT gmail DOT com 🙂 I greatly appreciate your time!! You have a great blog. Loved it..
Is it possible to have an email address, I would love for you to feature in a blog. This is a lovely blog you have created here. So readily accessible with the wonderful photos (your own I gather) along with meaningful quotes, poems and Bible verses. It is such a nice place to visit. Thanks for your efforts. Yours is a lovely blog. I am particularly touched by your decision to retire and take care of your father. It is usually said a child is the walking-stick of the parents at the latter’s old age; but not all children are that to their parents. You are a great example. God bless you! Yea! Just caught up with you via Wally Fry’s site. So nice to meet you! Looking forward to more! Julie (cookie), I read you poem on Dawnliz’ page. It is powerful and so true. So I came visiting. Hope you will visit me in return. You seem very knowledgeable and write well. I think we share concerns for the condition of our world. I will be following you. What an inspirational blog! Thanks for blessing us with your writing Julia. You are welcome! Will definitely keep up. That story has always bothered me, Julie. First, What was Paul doing on the road to Damascus? He worked for the Jewish Sanhedrin, whose jurisdiction stopped short of the Sea of Galilee (which is one reason Yeshua spent most of his ministry there, out of their reach), yet Paul was on his way, walking, to Damascus, Syria, for no explicable reason. Further, many reputable neurologists have diagnosed Paul’s symptoms – blinding light, falling down, auditory hallucinations – and determined that he suffered from temporal lobe epilepsy, and was not the recipient of some supernatural experience. Being scientifically ignorant, he had little choice but to give a supernatural explanation to a natural experience. I can’t imagine you’d wish that for me. well my friend–as we had no neurologists back in the day to check on this sudden case of supposed epilepsy, I won’t wade out into the what ifs of diagnoses waters…as we’d be grasping at straws…and I realize that you in turn will tell me it is I who is grasping at straws…and well that may be…I am not a biblical historian nor theologian…but I know getting knocked off my feet when it happens…so forward I go …with or without you Arch..as I have seen the light of His Truth. I suspect it will be without as we are, as you say, at an impasse. Arch I am not the debater as, say, Wally and CS are—that’s what they seem to like, that’s what they are good at (despite you’re cry to the contrary), and it is their “ministry” as it were. Me, I just share my heart of where I’m at with this whole journey thing. My heart and eyes are fixed on the cross of Christ—plain and simple…and you can try to persuade me otherwise, debate, argue, fuss and cuss till the cows come home…but He is my Savior Arch, God is my God…and I commit my heart and soul to Him—it’s as simple as it comes. So I can’t state it any more plainly than that—and for me there is no real discussion as I’ve stated my position—there is no swaying anymore, no refuting–I’ve found my Truth. I wouldn’t even try, Julie – pax vobiscum. Hello Julie my name is Deborah and I live in Australia. I really enjoy your posts on your blog. I have seen your most recent one about the shop. I am praying for our faithful God to bring something good out of this situation for you and all of your family. May God continue to richly bless you with His overwhelming, vast love and peace that passes all understanding overflowing your heart and your mind today and always- love Deborah. Julie! I’m trying to figure out how to follow your blog. I’m not seeing a follow button (help me out). I’m glad I found your blog again! I’ve been gone for a year or so, decided to come back and try again. Always enjoyed reading your posts! Ah! New picture. Very nice. And a touching article about the bird. God bless. Hello, Julie! I am so delighted to get to know you better through your “about.” And I feel you are a kindred spirit. We share a great many things in common. I also taught IB. And I cared for my mother in our home as she suffered and eventually died from cancer. You can imagine, then, how much your words here resonated with me. I look forward to following your faith journey here. I’ve so enjoyed the posts that I’ve already read. God bless you big time! Thank you Lynn for your kind words. I am sorry about your mom…being a caregiver, especially for a terminal loved one is so very hard. Written so long ago – but I still enjoyed reading it again today. There is so much of Christ’s life in you. Thank you. YAY Cathy—I’ve found you too!!! I emailed Rob Frank (yep that’s how I remember him) last night. I have missed you guys all these year but have tried keeping up by asking Harriett (Uncle Paul’s and Aunt Mickey’s daughter) who stays in touch with Monty, how ya’ll are—I told Rob Frank about the great memories I have of visiting ya’ll in Monroe. Dad always spoke of his “cousin Frank” and how much he missed him. This calls for a reunion!!!!!! It’s wonderful to connect with you here Julie!! I work in biodiversity conservation. 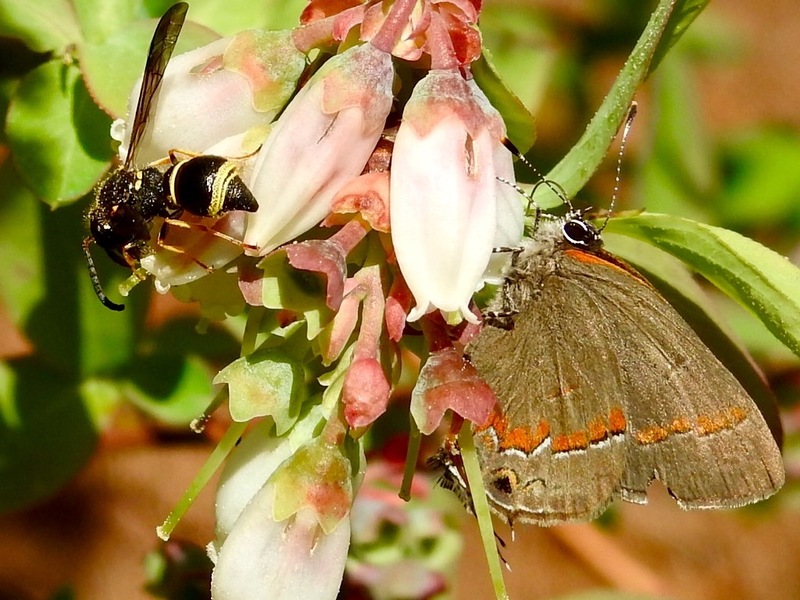 I’m preparing a talk that involves the importance of blueberry blossoms as food for pollinators. Would it be OK to use some of your photos and credit you?